The question of how religious principles and obligations apply to environmental issues will be the topic of a campus conversation on April 5. 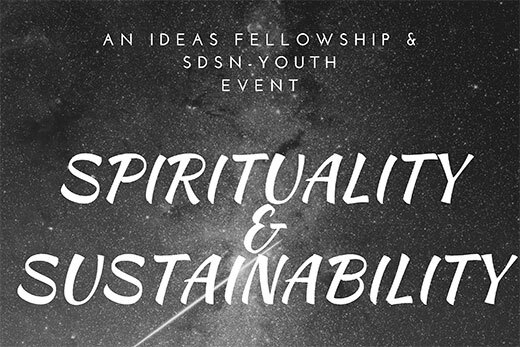 The Sustainability and Spirituality event will feature members of the Catholic Student Union, Hindu Students Association, Muslim Students Association, Emory Hillel, Chabad at Emory, and Emory Buddhist Club in conversation about their faith’s considerations of sustainability. The event, which comes as many world religions are applying their sphere of influence to social and environmental concerns, will feature short presentations followed by a full discussion with the audience. "This event is the first of its kind on our campus, with leaders and members of Emory's diverse faith groups coming together to share their values with the wider community and strategize common solutions,” says Emory College sophomore Sienna Nordquist, a Woodruff Scholar and the Emory coordinator for the United Nations Sustainable Development Solutions Network-Youth, who organized the event with the IDEAS Fellowship. “The interaction between all of the groups is not just exciting, but inspiring," Nordquist adds. The event begins at 7 p.m. April 5 in the Center for Ethics Commons. It is free and open to the public.